S.H. MonsterArts continues its aim to be the number one series of high quality monster action figures on the market today with the newest addition coming straight from Alien vs. 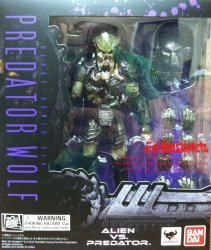 Predator: Requiem- the Predator Wolf (Heavy Armed Ver.)! This deluxe figure is only available as a web exclusive in Japan, but comes to North American shores as a regular release thanks to Bluefin Distribution. Faithfully proportioned as it appeared in the film, the set portrays the character after he picks up additional tools from the crashed ship in the movie. Tamashii Nations" creative team has made use of both resin and diecast materials for the very best results in quality while perfectly maintaining the realism seen on screen. This version of the character contains extra tools, such as claymores with removable holsters and two shurikens. Special interchangeable hands for use with the shuriken have also been included for replicating specific scenes from the movie. Additionally, this version of the Predator Wolf will feature two plasma cannons, a big cannon, and alternative parts in order to depict the cannon after being broken. Both short and long spears, as well as coiled and uncoiled whip parts are also featured, in addition to interchangeable heads and a full array of interchangeable hands. In the world of AVP, there's no hunter better equipped. Collectors Note: THIS IS AN ORIGINAL, NOT A KNOCK-OFF FROM JAPAN. Factory sealed in full-color packaging with display window, sealed inside manufacturer's brown carton. The manufacturers brown case is used solely for the purpose of protecting product during shipment and is not meant to be a collectible box. Figure may not be exchanged due to damage or discoloration of brown outer case. Some photos show loose figures as an example only. 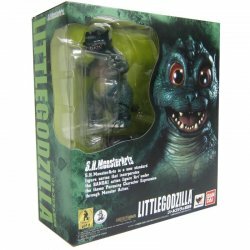 MyMovieMonsters.com also offers other Bandai S.H. MonsterArts figures.